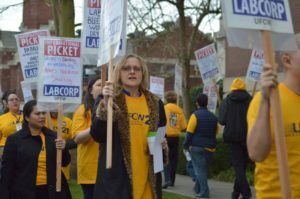 Hundreds of members of Local 21 who work at LabCorp in Seattle joined with community allies to rally for a fair contract on March 13. LabCorp is a health care diagnostics company, and these workers provide care and diagnostics in labs, clinics and hospitals across western Washington. The more than 700 LabCorp workers have been in contract negotiations since June 2017, and are fighting for competitive wages, affordable health care and safe staffing levels. Because of their collective action on March 13, there has been positive movement at the bargaining table.